I would also be interested any Katana made like this, but have never heard of such a thing. I own the Qi jian by Hanwei. I can attest that it is a fascinating sword. This kind of construction isn't common because (a) it's capital-intensive, and doesn't suit small workshop production, and (b) it isn't historical (mostly), so isn't very useful for making historically-accurate swords. where the blade and grip/pommel might be a single billet, with a guard forge-welded on. This type of construction with welded-on guard turns up on other militia/village jian, and some more examples can be seen at forum.grtc.org/viewtopic.php?t=893 (some have guards riveted on, and some have guard and pommel riveted on; many would have had grip scales so not quite one-piece). There are also one-piece Han dao. Usually, the ring pommel is made as a separate piece, and the end of the tang folded over it to attach it securely, with the folded-over end of the tang either forge-welded or riveted. The pommel on a dadao is often forged from the end of the tang, but dadao usually have grip scales and a separate guard. Perhaps the Hanwei Tactical Katana with a slab handle on a real full tang. Thanks! Any idea what type of steel it’s made of? I’ve been trying to figure this out but all the copy for it on the various websites omits this bit of info. Thanks for the info, much appreciated. The Jungle Beast’s price and spring steel construction look good, might pick one up. That looks like a good one too, very tough, thanks! Check ebay for the Zombie Tools Apokatana (the now discontinued, older model)... or have BKS making something up for you! They usually just leather wrap their massive tangs. Well, the OP asked for one-piece construction, so no tsuba... while yeah, the duralum slabs are still there. But he could also order the actual model without tsuba and slabs - just the bare blade. Sure possible. I am unsure what type of steel was used to make my qi jian. It is a curious sword to be sure, and makes a delightful noise when gently struck. I guess a one piece construction including a guard is very hard to forge -at least with ancient techniques - but easy to cast, so I think it was primary used for bronze or cast iron swords. Btw. the Hanwei Trondheim viking sword is also a one piece construction. 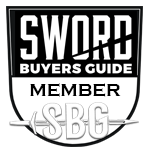 Bronze swords usually have quite small guards, or often no guard. The ones with larger guards are usually multi-piece, with the blade cast separately from the hilt, and the guard integral with the hilt. Maybe there is some difficulty (perhaps you want the bronze to flow down the blade part of the mold ASAP, instead of having a guard fill up first). OTOH, it's possible to forge integral guards, as can be seen from things like this: www.oriental-arms.com/item.php?id=7017 (unlike most krisses, this one has an integrally-forged ganja (the base of the blade)). Other things like karakulak knives with chunky integral bolsters show that small guards can be done on a one-piece sword. A large guard and a large tang together would be harder, and why bother when you can make the guard separately? No pre-modern cast iron swords. The Trondheim has somewhat funky balance and is heavy for it's rather petite size. Its handling doesn't benefit from the one-piece construction. Looking at the balance of the Hanwei Qi Jian, neither does it. Cast steel is the modern technique, the Chinese worked with cast iron already 200 BC, but I'm not sure if they made swords this way too. Cast iron is a very bad material for swords of course. The Chinese knew what they were doing, and used cast iron as the cheap option for things where brittleness wasn't a problem, and steel (forged) for swords.